In other words, he's trusting “assurances” from McConnell, who will inevitably screw him over—along with the dreamers—when he either refuses to vote on DACA, or marshals enough votes to kill it for good. Make no mistake: This is an abandonment. And 32 fellow Democrats—basically, everyone who isn't planning to run for president in 2020—went along with him. Hearing reports that Schumer has agreed to fund construction of an impenetrable border dome in exchange for amnesty for one undocumented irish guy living in Boston. Senate Democrats are about to collaborate in the exile of nearly a million innocents and blow a generation-long hole in their base because they worry about transient polling ten months from an election and exclusively listen to morons. Does the GOP tax plan give Mitch McConnell an extra deduction for his ownership of Chuck Schumer? 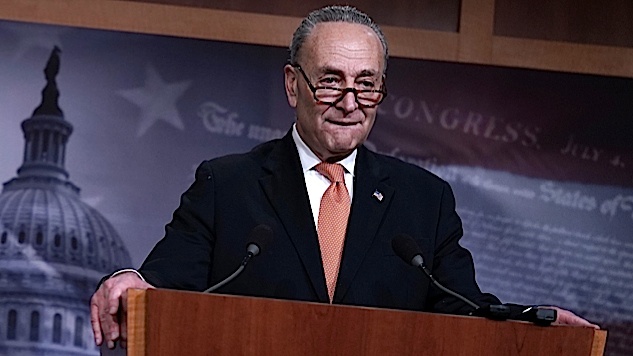 "yes, Senator Schumer, you have my word on it."